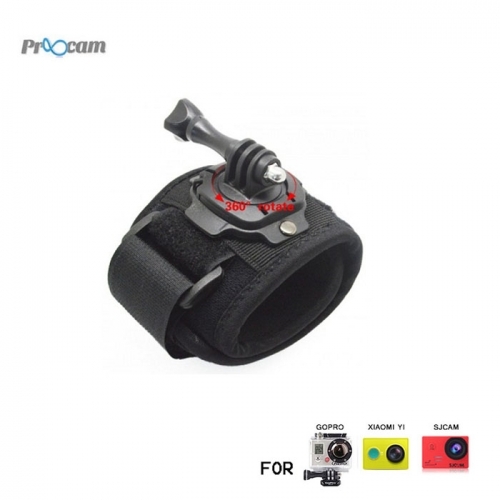 Proocam Pro-J128 360-degree rotation,New Wrist Mount with Screw , This 360 Degree Rotating Quick Release Buckle Mount with Thumb Screw for GoPro Hero 1, Hero 2, Hero 3, Hero 3+, Hero 3 Plus, Hero 4 Cameras - Black gives you the freedom and flexibility to capture a variety of previous moments when doing outdoor activities. It is perfect for you to attach your Gopro camera to any Sports like Surfing , Skateboarding , Kayaking , Sailing , Running , Biking , Flying and many more. compound in the pictures , camera good product , also is quality camera good partner! Mount plate can rotate 360 degrees, and can be locked.